Having a jacket that offers protection in more ways than one is definitely different, as with the case of the Xip3. The Xip3 boasts a trio of distinctively different functions which consists of a jacket, a backpack, and a pillow. What is even more amazing is the fact that the Xip3 works well in all three functions without missing a beat. 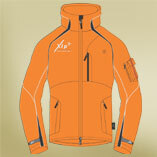 As a jacket, the Xip3 features fantastic waterproof capabilities as well as a breathable performance fabric which controls permeability. The Polartec 200 lining also provides protection against the biting cold without leaving you feeling as if you are in a sauna. Whenever you need to head out, you can always make use of the backpack located behind the jacket, making it the ideal carrying companion. The Powerstretch panel ensures you have ample space to store all the essential items without inducing a tear. When night falls, the Xip3 can be turned into a soft, comfortable pillow. There shouldn’t be any worries of staining the pillow as it comes with a stain-resistant side which is waterproof as well, giving you a good night’s rest under a blanket of stars. Unfortunately, I still have one niggling question in the back of my mind. The Xip3 works just fine should we carry virtually nothing fragile or sensitive inside the backpack under nice weather conditions, but it doesn’t make sense to sleep on my cellphone and reading glasses when it is used as a pillow. Does anyone care to enlighten me further on how it works? All in all, kudos to the Xip3 Hybrid Revolution Gear team for thinking of such a brilliant 3-in-1 solution.